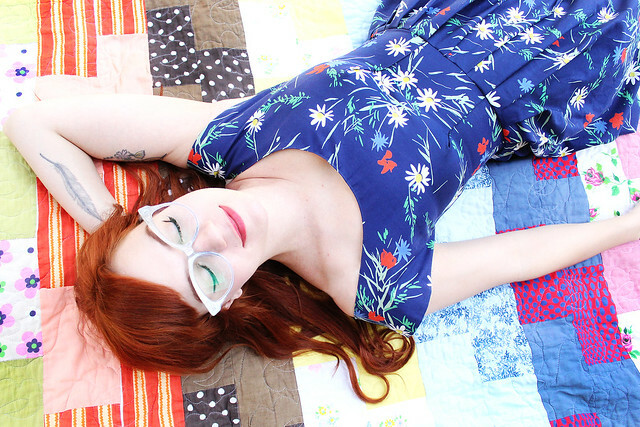 I'm so excited to announce that I've been working with BonLook for a few months now, designing my dream glasses. The whole process has been extremely fun and we've turned out with my favorite pair of cat-eye glasses I've ever owned! I had the opportunity to choose the names, so if you visit the page you will find "Glitter Tort, Larissa Lake, and Poesy Pink". I'm sure you know who the Poesy Pink glasses are named after, and Larissa is Hope's middle name. The pink glasses are the winner for me, but the silver/blue ones come in a close second. 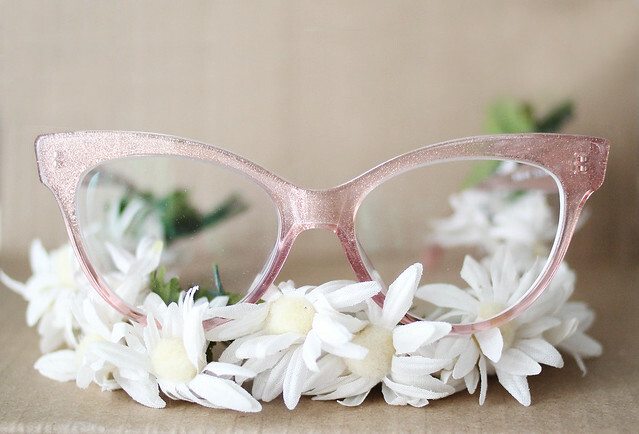 The tortoise frames have silver glitter on the inside, so you still get a little bit of sparkle, without being super flashy! I really love all three so much. I've been eagerly anticipating the release and I'm terribly excited! You can find out more about the glasses by visiting the Skunkboy page here. xo. **Blue floral dress from For the Beloved. Yellow dress is vintage. Thank you so much! I've been crazy excited about them! I love all of them! Can you return if they don't fit? I looked at the measurements and they are a little bigger the my current glasses. Hi, Amanda! 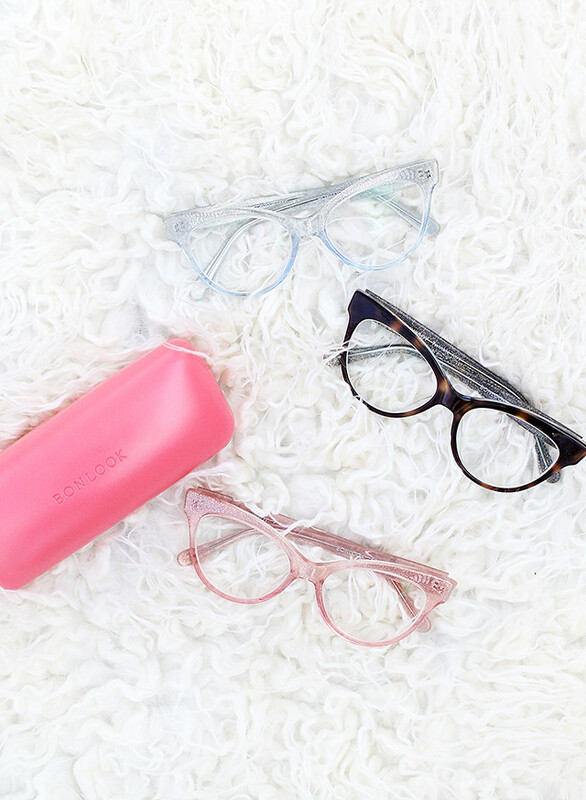 BonLook offers free returns, so no worries if they don't fit! Adorable post! I love the glasses - congratulations! These are seriously so cute! I love the color choices! i love that blue dress! They look great! Well, no surprise that I liked them, because I really admire your style! But congratulations anyway! 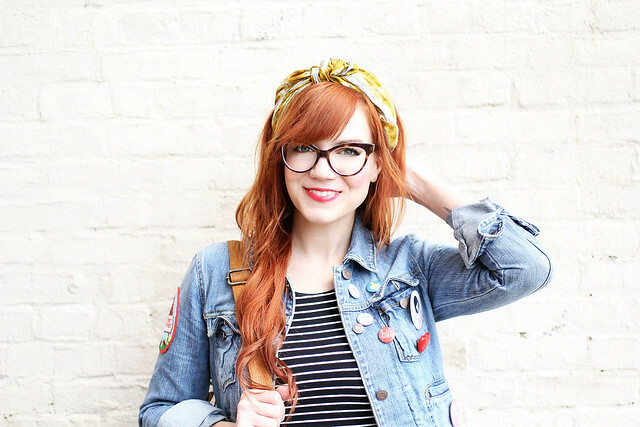 I love cat-eye glasses! Especially the blue ones are dreamy!! Super cute! I have darker blue cat eyes but they are a little more angular (if that makes sense). I don't really care for them though because the color doesn't go with my skin tone. Oh, the pain of impulse buying glasses. I would probably go with neutral next time... Or the tortoise ones you have here haha. I will have to check them out. Yaaaay! Kala's designs are beautiful! I just bought a new dress from her last week b/c I couldn't resist. I'm publishing my own glowing review of Bonlook on Monday, and gave a nod to you! Great post, Katie! Congrats, and a happy coincidence. Congratulations!!! They are beautiful! I bet the sparkle makes you instantly happy when you put your glasses on :) I specially love the Poesy Pink ones although being a brunette maybe the Glitter Tort is something I am more used to wear. How completely fun! Also, what a great momma that you are that you named them after your little ones! I'm loving the tortoise one, but they are all so fun! Goooorgeous glasses! I even clicked through onto Bon Look before remembering that I had laser eye surgery. Still getting used to not needing glasses! !